Delos remains today the largest, freely accessible archeological site on an island in Greece and one of the largest in Europe. The place is not inhabited and visiting it is like taking a trip back in time, in three different historical times to be exact, since the surviving monuments and exhibits included in the Archeological Museum of Delos' collections cover the prehistoric, classical and hellenistic periods. The history of the place is lost between actual history and myth. According to the latter, Delos is the birthplace of the twin gods, Appolo, God of sunlight, music, healing, prophecy and poetry, and Artemis, Goddess of the moon, hunting and forrests. Actually, Delos was supposed to be a piece of land that kept floating accross the sea. Leto, the twins' mother and Zeus' mistress was ready to give birth, but couldn't find a place to do it in peace because Hera (Zeus' scorned wife) was hot in her pursuit. So, Zeus pleaded with his brother Poseidon, God of the Seas, to immobilize Delos, so that Leto could finally give birth. And the two twins grew up to become two of the most important Gods of the Greek Dodecatheon. Mykonos hotels! Click to book now. After the Percian wars, the Greeks formed the Delos Alliance so that they could be prepared to deal with outside threats, if ever they decided to resurface. During the first years, Delos was the centre of the Alliance, the place were their common funds were stored and where their representatives met. But then, using some pretext, Pericles, convinced the Allies to move the Alliance's treasury in Athens. Cue: The Golden Age of Pericles! As if depriving of Delos' status wasn't enough, the Atheneans then decided to 'purify' the island by digging up all the existing tombs and transfering them to the neighbouring island of Rhenia. 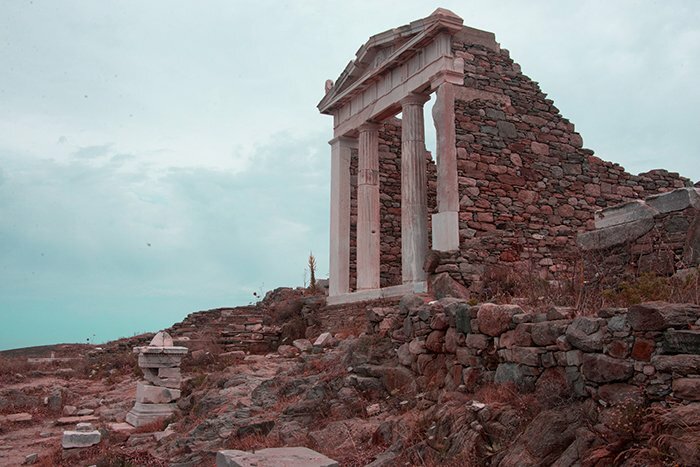 From then on, no one was allowed to be born or die on the Holy Island and Delos' prestige faded under the Athenean rule. It was only after Alexander the Great's death, that his successors declared Delos independent and the island started flourishing again. Come the Romans who abolished duties and taxes, in an effort to hurt the neighbouring harbor of Rhodes, Delos really took up. Most of the monuments still standing for the visitor to see today come from this period (after 166 b.C. ), when Delos became something like the Cayman Islands of the hellenistic times: rich bankers, traders and artists opted to live and work here, where they were able to enjoy a high quality lifestyle free of taxes! With money comes rebuilding: all the new inhabitants of Delos started flaunting their riches by hiring technicians to build them bigger and better houses. As a result, the island population soared to 30.000 at the beginning of the 1st century b.C., while more than 750.000 tones of merchandise was traded through Delos' port annually. But the most important element of all is the fact that all these people came from different places of the world, not only from Greece, but from Asia and Africa, they spoke different languages, worshipped different Gods. And still, they found a way to live, work and entertain themselves together, their children learning to speak and write Greek at the same school.s Delos was then the epitome of the cosmopolitan city: where people from all over the world gathered and lived peacefully. But, Delos' flourishing again came to an abrupt stop. All the wealth and fame that surrounded the place soon attracted evil intentions and, first in 88 b.C. Asian king Mythridatis, then in 69 b.C. the infamous pirate Athinodoros looted the island and uprooted its inhabitants. Delos was inhabited again several centuries later as an important Christian community, but it soon fell into ruin once more with pirates and smugglers using the small island as a stronghold for the centuries to come. The site first started been excavated as early as 1872. Today, Delos lives on as a place of important archeological findings and home to some of the best preserved monuments of antiquity. Most of the sites have been reconstructed in their original form right were they were found, while the Archeological Museum of Delos houses 9 rooms full of statues, vessels, epitagraphes and one of the largest collections of everyday objects used by the people that have inhabited Delos throughout its long history. You may visit the island daily (the museum is closed on Mondays) from April until October. There are regular ferries (departing every hour or half hour during the peak summer months) from the new and the old harbour in Mykonos, also offering packages including admission tickets to the sites and guided tours in many languages. You might have arranged your vacations in Mykonos, but Delos was the true cosmopolitan of Cyclades first! 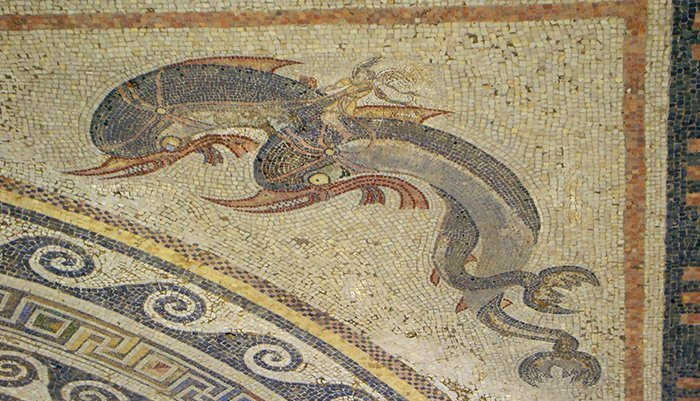 So, don't miss out on a stroll along the lions' gate, a visit in the theatre district and a tour of the houses of the comedians, the masks and the dolphins, named after their decorative mosaic still visible today.